week ago owing to listra cas y office at aruba, bonaire, còrsow y some country european. esakinan did take lugar in cuadro of one investigacion complicá y on escala big dirigí on prácticanan of labamento of coin cu recherche samenwerkingsteam (rst) of the netherlands, antilles dutch y aruba owing to begin at 2008 at còrsow on encargo y bao of guia of ministerio público of antilles dutch. examine labamentu of coin corto time after cu the investigacion owing to start, owing to leave at cla cu the prácticanan of labamento of coin is relacioná cu traficacion organize internacional of drugs during much year. in esey they owing to transport míles of kilo of drugs for of américa latina cu europa because; destinacion end. the conexion cu the caracter y volúmen of the traficacion here of drugs, cu is relacioná directamente cu the sospechoso owing to.p.m. bibá at the netherlands, ministerio público of antilles dutch owing to ask autoridadnan dutch for start one investigacion more formerly n’e traficacion here of drugs. had the suspicion cu the traficacion here owing to generá one benefit multimionario p’e sospechoso owing to.p.m., that atrabes of construccionnan compleho y ingenioso of labamento of coin owing to invertí this the.o. in proyectonan of biennan inmóbil among they at bonaire. fast the parkèt nacional of rotterdam owing to begin cu the investigacion here y the servicio nacional of rechèrche at rotterdam owing to ehecutá this caminda on peticion of ministerio público of antilles dutch owing to haci usage also of the perisia of one team financiero económico of rechèrche nacional y the experticio of the office of legislacion of kitamento of ministerio público (boom). the investigacion of labamento of coin cu rst còrsow owing to haci is dirigí specialmente on inversionnan in biennan inmóbil at bonaire cu coin procedente of crímen. 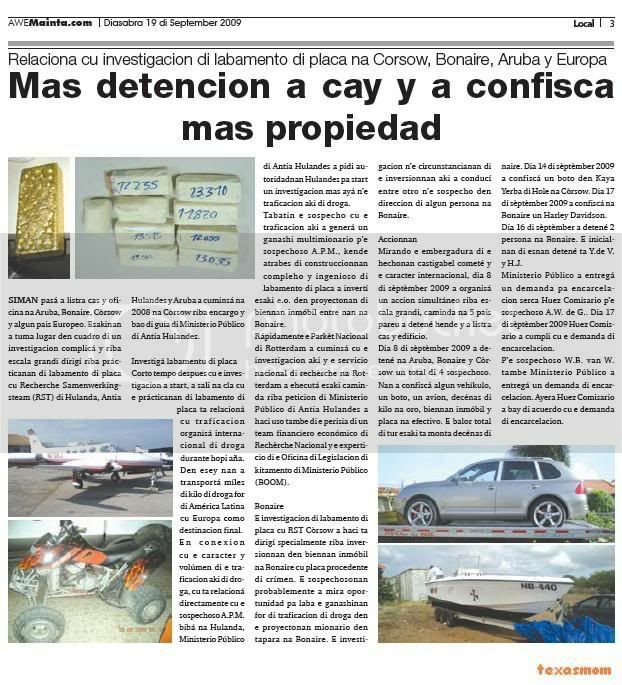 the sospechosonan probably owing to see oportunidad for wash the ganashinan for of traficacion of drugs in the proyectonan mionario in tapara at bonaire. the investigacion n’e circunstancianan of the inversionnan here owing to conducí among another n’e suspicion in direccion of some person at bonaire. mirando the embergadura of the hechonan castigabel cometé y the caracter internacional, day 8 of september 2009 owing to organize one accion simultáneo on escala big, caminda at 5 country equal owing to detené person y owing to listra cas y edificio. day 8 of september 2009 owing to detené at aruba, bonaire y còrsow one overall of 4 sospechoso. they owing to confiscá some vehicle, one boat, one plane, decénas of kilo at gold, biennan inmóbil y coin at efectivo. the value overall of all this is monta decénas of million guilder. continuacion of the investigacion diarazon day 9 of september 2009 owing to efectuá 4 listramento more serca instansianan at bonaire. day 14 of september 2009 owing to confiscá one boat in street grass of smell at còrsow. day 17 of september 2009 owing to confiscá at bonaire one harley davidson. day 16 of september owing to detené 2 person at bonaire. the inicialnan of esnan detené is y.de v. y h.j. ministerio público owing to deliver one demanda for encarcelacion serca huez comisario p’e sospechoso owing to.w. de g.. day 17 of september 2009 huez comisario owing to accomplish cu the demanda of encarcelacion. p’e sospechoso w.b. van w. also ministerio público owing to deliver one demanda of encarcelacion. yesterday huez comisario owing to bay of acuerdo cu the demanda of encarcelacion. diabierna afternoon owing to enter informacion of one action at the.p.b. hato. at once owing to dirigi one patrol policial n’e sitio. one rato after owing to enter informacion cu have destruccion of car did take lugar hour cu esnan cu was bringando owing to cuminsa throw stone cu baranca on another. more call owing to enter indicando cu this also was the caso at one snack at hato y n’e rotonde of sta. helenastraat. owing to dirigi more patrol n’e sitionan, but not owing to succeed achieve the bringadornan. police will follow cu the investigacion. 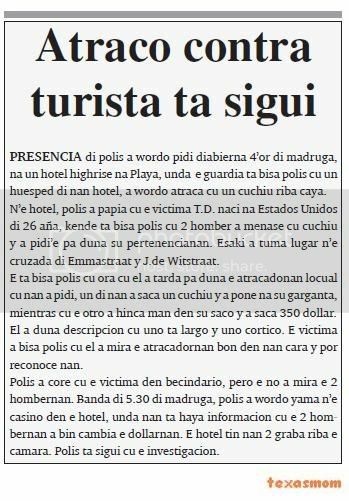 On September 25 a tourist was robbed by two men in Oranjestad. On the same evening, home owners in De Vuyst were robbed and injured by several men who broke into their home. On September 28, a Chinese supermarket in Rooi Koochi was robbed by a teenager. The suspect was later arrested. Two days later, the proprietor of a car rental company in Oranjestad was robbed by two masked men when he opened his store. 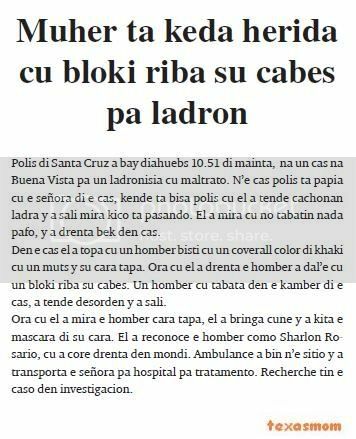 The victim was beaten and tied, and the office was ransacked (Diario Aruba, Awe Mainta, Extra). 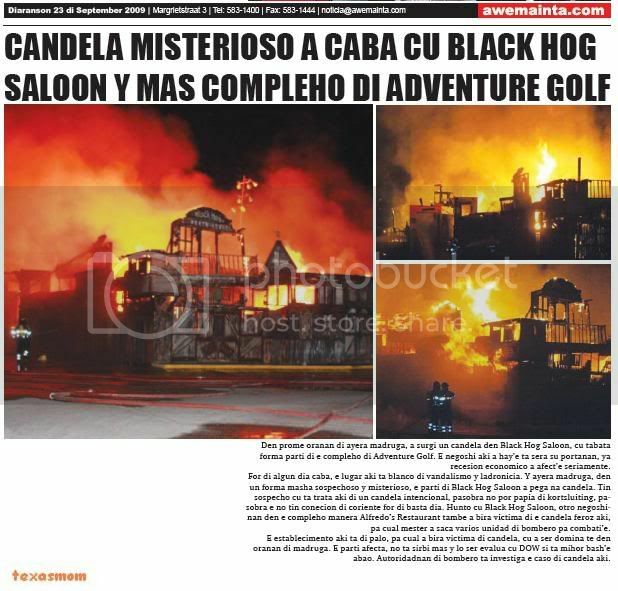 in first oranan of yesterday madruga, owing to surgi one candela in black hog saloon, cu was form part of the compleho of adventure golf. the business here owing to hay’e is close his portanan, already recesion economico owing to afect’e seriamente. for of some day end, the lugar here is blanco of vandalismo y ladronicia. y yesterday madruga, in one form very sospechoso y misterioso, the part of black hog saloon owing to stick at candela. have suspicion cu is deal here of one candela intencional, because not can talk of kortsluiting, because the not have conecion of coriente for of enough day. together cu black hog saloon, another negoshinan in the compleho as alfredo’s restaurant also owing to become victima of the candela feroz here, for cual have to owing to saca several unidad of bombero for combati’e. the establecimento here is of tree, for cual owing to become victima of candela, cu owing to being domina till in oranan of madruga. the part afecta, do not serve more y will being evalua cu dow if is mihor bash’e abao. autoridadnan of bombero is investiga the caso of candela here. monday afternoon hof owing to cuminsa cu one part of tratamento of the caso of tiramento of gang of dakota. in sitting-room of corte was present family of alfred y nigel williams, y also family of derrick dania. the rumannan williams owing to wordo representa for mr. edwin duijneveld, derrick dania owing to wordo representa for mr. lotter homan y paredes berio for mr.figaroa. hof owing to splica cu by cu not have sufficient time for deal the caso in his totalidad is pospone the caso although cu hof wanted atende two sharp serious cu is regarda nigel williams y paredes berio. t’asina paredes berio his caso owing to wordo deal for one corte militar y the citacion is talk of corte of husticia y esey is crea one problem, already cu the have to is one asunto militar. procurador general mr. robert pietersz owing to splica cu had one aberration in citacion for corte militar, although cu the caso will take lugar in corte. esey nifica cu hof do not autoriza for atende the caso. procurador general owing to sugeri for hof declara his self not admisibel for deal the caso here. p’e caso nigel williams, hof owing to remarca cu the documentacion do not completo. ministerio publico because; acusado owing to apela, but ministerio publico after owing to wing the apelacion inside. 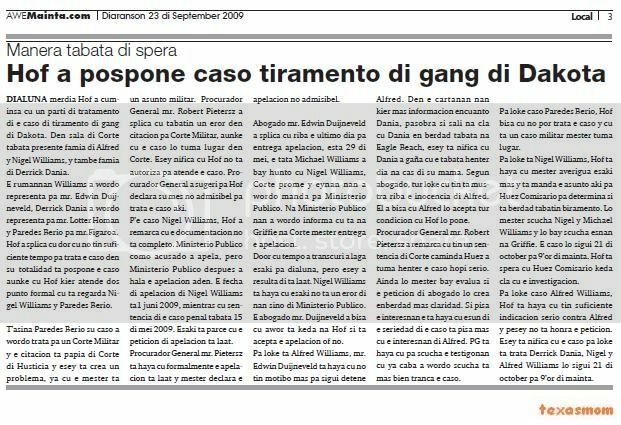 the date of apelacion of nigel williams ta1 june 2009, while cu sentencia of the caso penal was 15 of half 2009. this is seems cu the peticion of apelacion is late. procurador general mr. pietersz is achieve cu formalmente the apelacion is late y have to declara the apelacion not admisibel. advocate mr. edwin duijneveld owing to splica cu on the ultimo day for entrega apelacion, esta 29 of half, the father michael williams owing to bay together cu nigel williams, corte first y eynan they owing to wordo send for ministerio publico. at ministerio publico they owing to wordo informa cu is at griffie at corte have to entrega the apelacion. door cu time owing to transcuri owing to let this for monday, but esey owing to resulta of is late. nigel williams is achieve cu this do not one aberration of they but of ministerio publico. the advocate mr. duijneveld owing to tell cu now is stay at hof if is acepta the apelacion or not. for thing is alfred williams, mr. edwin duijneveld is achieve cu not have motibo more for follow detene alfred. in the cartanan they wanted more informacion encuanto dania, because if leave at cla cu dania provided that berdad was at eagle beach, esey is nifica cu dania owing to lie cu the was all day at home of his mother. according advocate, all thing cu have is show on the inocencia of alfred. past owing to tell cu alfred will acepta all condicion cu hof will place. procurador general mr. robert pietersz owing to remarca cu have one sentencia of corte caminda huez did take all the caso much earnest. still will have to bay evalua if the peticion of advocate will crea enberdad more claridad. if pisa the interesnan the is achieve cu esun of the seriedad of the caso is pisa more cu the interesnan of alfred. pg is achieve cu for listen the testigonan cu already end owing to wordo listen is more bien tranca the caso. for thing caso paredes berio, hof tell cu not can deal the caso y cu is one caso militar have to take lugar. for thing is nigel williams, hof is achieve cu have to averigua this more y is send the asunto here for huez comisario for determina if is berdad had biramento. will have to listen nigel y michael williams y will bay listen esnan at griffie. the caso will follow 21 of october for 9’or of morning. hof is wait for cu huez comisario stay cla cu the investigacion. for thing caso alfred williams, hof is achieve cu have sufficient indicacion earnest contra alfred y pesey do not honor the peticion. esey is nifica cu the caso for thing is deal derrick dania, nigel y alfred williams will follow 21 of october for 9’or of morning. for some time have ciudadano cu is come in contacto cu husticia, because they was carga arm of candela without permit or autorizacion (esta, ilegalmente) or was envolvi in one incidente of tiro. various person owing to wordo condena pesey in corte. as conoci, one cantidad of arm owing to wordo steal some time happen y owing to wordo plama also bao personanan cu as was in contacto cu husticia several trip end or is conoci for they actuacion violento. cuerpo policial of aruba, servicio of seguridad of aruba because; ministerio publico is seriamente preocupa p’e cantidad of arm cu is disponible ilegalmente. is obvio cu have to actua contra this. is come acerca cu during the campaña of eleccion owing to stay claramente demostra alabez cu emocionnan can lever y iritacionnan is stay expresa more rapido. for motibo of seguridad for one y all y for motibo of orden publico, ministerio publico is give esnan cu have one arm of candela or municion without permit or autorizacion the posibilidad for entrega this dentro of two month, entrante today till 20 of november 2009 voluntary at keep of police at oranjestad during oranan of trabao, esta, of 7.30’or of morning for 4.30’or of nightfall. ministerio publico is adverti all person cu have one arm of candela without permit for entrega this more soon cu is posible. if they haci this, they will not wordo persigui for posesion ilegal cu they had the arm. esnan cu viola the reglanan can wait for hand duro: detencion y permanence in detencion preventivo till cu the caso parece fast huez, where will exigi one castigo incondicional high. recientemente corte of apelacion owing to declara in one sentencia cu the sun mature cu one person is carga one arm of candela without permit, will have to wordo castiga cu one castigo of jail incondicional for one time of one year or more. ministerio publico is wait for cu one y all is compronde cu the maneho severo here will give one aporte at one aruba more assure. monday night owing to enter informacion cu at height of catholic of beach will have a injury cu machete. at once owing to dirigi police because; ambulance n’e sitio. at arrival of the patrol policial owing to come constata cu here do not deal of one caso of kapmento, but if one caso of maltrato y the victima had have to atencion medico debi cu not less cu 7 young owing to dune one beat without none motibo. at arrival of ambulance, owing to atende the victima y owing to achieve necesario for hibe hospital. asistencia of police owing to wordo ask monday 12.45 of madruga at one cas in mispelstraat, where two man owing to menasa the inhabitant of throw handgranaat in his cas. n’e cas police is talk cu the inhabitant therefore.y., that is tell cu one jeep blanco suv new owing to come stop fast of his cas cu two man in dje. the is tell cu past owing to reconoce the chofer because; one such d., that is one bendedo of drugs at dakota. according descripcion cu past owing to give of the such d., cu is color cla, cabey largo, y cu tooth of gold. the is tell cu he sit near of dje, had one t-shirt yellow dress. the two hombernan owing to tell therefore.y.cu they're buscando one such bone. also they owing to tell therefore.y.cu one such therefore. owing to steal they coin, but is bone they're buscando. hour cu therefore.y.a tell they cu the not know where bone is, neither niether the wanted owing to bay cu they, they owing to menase of throw handgranat in his cas. therefore.y. owing to tell police cu one of the hombernan had one arm of candela behind his back. habitantenan in the district owing to calling police, because; cu they owing to see the car is circula enough trip in the district. police owing to busca the suv blanco, but not owing to come across cu they. police owing to tell therefore.y p’e bay give complaint at recherche, more soon possible. monday morning, police of san nicolas owing to bay napa of cura cabay where ladronnan owing to break roof y owing to enter inside. eynan police is achieve informacion cu desconocinan owing to break roof y owing to happen by of the plafond y owing to enter in the lugar y owing to bay cu the box of coin in cual had 700 guilder. police on control monday afternoon 12’or, behind certified megamall is see one man canando y the is ask police asistencia. he is bay cu the is work in one store cu is sell articulonan electronico cu owing to end of wordo atraca. the is give police descripcion of the atracador y is tell they cu the is at height of maduro enterprises. police owing to bay n’e sitio y owing to come across cu the choler m.a.b. naci at aruba of 31 year at height of ex azv. the was cuadra cu the descripcion y in his hand the had popcorn y also chips. y also the had one playstation portabel sony new in his box. police owing to detene y owing to tell owner of the business for bay give complaint. strand-politie is bay tuesday afternoon 11.30 at height of paseo herencia, where one tourist v.s. wanted haci denuncia. the is tell police cu the was march together cu two another person, mei-mei of marriot y moomba. hour cu they was canando bay tony’s roma, one car grey owing to happen near of they y one of the ocupante of the car owing to calculate his hand y owing to ranca his bag bay cune. they not owing to see the number of car. tuesday 12’or of afternoon the muher l.c.b naci at colombia is haci denuncia of ladronisia for of his car. the is tell police cu past owing to stop his car near of tax kantoor, y ladronnan owing to break in his car. the is tell cu they break the window behind y owing to bay cu one suma of 5 thousand guilder. also one another ladronisia did take lugar near of manuelito’s bar. eynan one tourist female naci at venezuela owing to tell police cu past owing to stop his car eynan y ladronnan owing to bay cu coin of his car. the is tell cu past owing to forget the door behind the car open. tuesday afternoon 1.30, police of north is bay for one asistencia at one cas at boegoeroei, where one father have problem cu his son drogadicto. 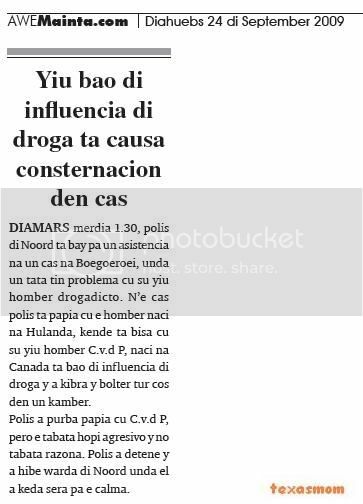 n’e cas police is talk cu he naci at the netherlands, that is tell cu his son c.v.d therefore, naci at canada is bao of influencia of drugs y owing to break y bolter all cos in one bedroom. police owing to try talk cu c.v.d therefore, but the was much aggressive y not was razona. police owing to detene y owing to hibe keep of north where past owing to stay close for her calma. one person is calling keep of police diahuebs 30minut after of 12 or of night, at one cas at papilon, y the is tell police cu have two young bad beat y all at blood.patruya of santa cruz owing to bay n’e sitio y owing to ask at once presencia of ambulance, because; cu the 2 hobennan was enough maltrata come across. one of they had one chop serious cu was bleed enough. n’e cas police owing to talk cu the two hobennan m.k naci at aruba of 18 year y owing to.c.c. naci at aruba of 18 year. they're tell police cu they was canando near of the thirst of mep, y of ripiente one are of boy owing to come on they y owing to cuminsa maltrata they. the is tell cu they owing to strike they cu stone, boter y also stone of alcera. they owing to tell police cu they owing to core enter in one cura of person, but the are owing to follow they slow y owing to maltrata they. police owing to see cu they had various golpi at they curpa y also clip cu was bleed. they're tell police cu is one such g., is cabesante of the are. they owing to tell police cu the motibo cu the gang owing to beat they was because they live at pos diminutive y santa cruz warriors have problem cu the gang of pos diminutive. after patrol owing to wordo calling for one asistencia at diromas where will have person injury y will have arm blanco envolvi. at arrival police is come across one of the victimanan, that is tell police cu he g. of santa cruz warriors, owing to maltrata they. the is tell cu they owing to core enter in the lugar for not achieve golpi, but so self g. owing to strike his girlfriend cu one boter on his cabes. police owing to calling for refuerso of unidad mobil, kendenan owing to arrive n’e sitio y owing to busca in becindario, but not owing to come across cu g. police owing to conseha the victimanan for they give complaint more soon possible for recherche follow cu they trabao. police of santa cruz owing to bay diahuebs 10.51 of morning, at one cas at buena vista for one ladronisia cu maltrato. n’e cas police is talk cu the madam of the cas, that is tell police cu past owing to hear cachonan bark y owing to leave see kico is pasando. past owing to see cu not had nothing pafo, y owing to enter bek in cas. in the cas past owing to come across cu one man dress cu one coverall color of khaki cu one muts y his cara tapa. hour cu past owing to enter he owing to dal’e cu one bloki on his cabes. one man cu was in the bedroom of the cas, owing to hear desorden y owing to leave. hour cu past owing to see he cara tapa, past owing to fight cune y owing to less the mascara of his cara. past owing to reconoce he because; sharlon rosario, cu owing to core enter in forest. ambulance owing to come n’e sitio y owing to transporta the madam for hospital for tratamento. recherche have the caso in investigacion. he m.b.naci at aruba of 32 year owing to bay keep of police of beach diahuebs 00.01 y is haci denuncia of maltrato y atraco. the is tell police cu the was at height of bushalte in wilhelminastraat, y 3 man owing to atrake of behind y owing to fight cune. past is tell police cu they owing to try less his celular bird of dje, but past owing to fight cu they, cu consecuencia cu the celular owing to cay y owing to break. m.b. is tell police cu the conoce one of the child hombernan because; one boy of de vuyst. the is color dark largo y delega. the is tell police cu after cu they owing to end of maltrate, they owing to core bay. police owing to bise p’e bay poli for tratamento y after give complaint at recherche. centrale post owing to send police cu urgencia at one cas at de vuyst diabierna 23.58, for one hincamento. n’e sitio, police is wordo informa cu miembronan of the gang of de vuyst, owing to hinca one pareha in they cas. hour cu police owing to arrive they're ask for ambulance, because; cu the pareha was at blood. they owing to see cu the muher had his nose break. ambulance owing to come n’e sitio y owing to transporta the victimanan for centro medico for tratamento. for 2’or of madruga, police owing to bay bek n’e cas y is see cu the cas was all destrui. all the bentanan of the cas was break y also bentanan of 2 car stop fast of the cas. police owing to constata also cu have one candela diminutive of forest. at instant cu the polisnan owing to arrive n’e cas the instant ey, not had none person n’e cas, because; cu the madam was at poli for tratamento. one rato after the madam owing to arrive y owing to become much angry, hour cu past owing to see cu his cas was all destrui. the gang owing to destrui all window of the cas y also glasnan of 2 car stop near of caminda. past owing to ask for recherche come at the cas. presencia of police owing to wordo ask diabierna 4’or of madruga, at one hotel highrise at beach, where the guardia is tell police cu one huesped of they hotel, owing to wordo atraca cu one cuchiu on caya. n’e hotel, police owing to talk cu the victima t.d. naci at estados unidos of 26 year, that is tell police cu 2 man owing to menase cu cuchiu y owing to pidi’e for give his pertenencianan. this did take lugar n’e cruzada of emmastraat y j.de witstraat. the is tell police cu hour cu past owing to tarda for give the atracadonan locual cu they owing to ask, one of they owing to saca one cuchiu y owing to place at his throat, while cu the another owing to hinca hand in his saco y owing to saca 350 dollar. past owing to give descripcion cu uno is largo y uno cortico. the victima owing to tell police cu past owing to see the atracadornan good in they cara y can reconoce they. police owing to core cu the victima in becindario, but the not owing to see the 2 hombernan. near of 5.30 of madruga, police owing to wordo calling n’e casino in the hotel, where they're achieve informacion cu the 2 hombernan owing to come change the dollarnan. the hotel have they 2 graba on the camara. police is follow cu the investigacion. presencia of strand-politie owing to wordo ask diabierna 2’or of madruga, near of the hotelnan highrise, cu is stay near of the hotzone new. eynan police is achieve informacion cu have one car stop cu bahul open is toca musica much duro y is molestia the turistanan. n’e sitio police is come across cu the car toyota starlet blau cu 3 person in dje y is drink cu bahul open y musica is beat duro. police owing to controla the car y owing to resulta cu the chofer r.t. not had none paper of the car. y also past owing to become onbeschoft contra polisnan. police owing to confisca the car y owing to hibe keep. police is follow actua cu hand duro. visibility team owing to ask asistencia of police diabierna 11.15, of afternoon, where they owing to grab one thief cu one car steal. hour cu police owing to arrive they're come across cu the conoci of police, j.e. naci at sand domingo of 18 year, that was cu the car a-47207 one nissan platinum color grey, cu owing to wordo steal in oranan of morning for of one cas in tarabanaweg. police owing to detene for ladronisia cq. joyriding. Page created in 6.162 seconds with 19 queries.